There were two runaway winners, and two nail-biting finishes at the Seniors Congress in Gloucester this weekend. The Championship Pairs was won in style by Glyn Meredith & Jo Copping (pictured), who finished over 4% ahead of their rivals. Paul Littlewood & Fiona Littlewood were second, with Pat Dowdeswell & Mike Ribbins in third. 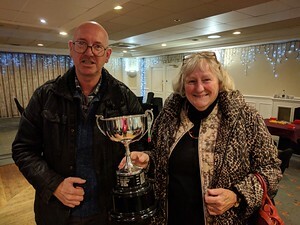 By contrast the 'B Final' of the competition was won by just 0.14%, with Simon Stokes & Alison Nichols (see picture here) pipping David Stimson & Roger Edmonds. The Swiss Pairs competition - for those eliminated from the Championship Pairs, or joining the congress later - was won by Celia Oram & Derek Oram (see picture here), a single victory point ahead of Ruth Edmondson & Brigid McElroy. The finish to the Swiss Teams was less exciting, with the undefeated team of Robert Procter, Michael Robinson, Phil Thornton & Nigel Wolfendale (see picture here) finishing 29 VPs ahead of David Barnes, Janet Barnes, Barry Wennell & Beth Wennell.